It has bnc connection at both ends to connect the camera directly to the dvr or tv (adaptor may be needed to connect to tv), a male dc power connection at one end for the camera and a female dc power connection at the other end for the power adaptor to connect to and a phono connection at either end, one to connect to a microphone and the other to connect to a tv or dvr recorder. 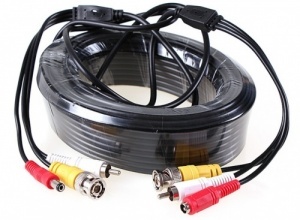 All our Security Camera Cables and Ip camera cables support up to 8Mp / 4K resolution so if you upgrade your camera at a later stage then unlike cheap cables, you will Not need to replace your cable. 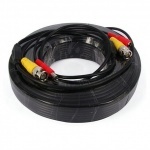 This cctv cable connects directly to any cctv camera. 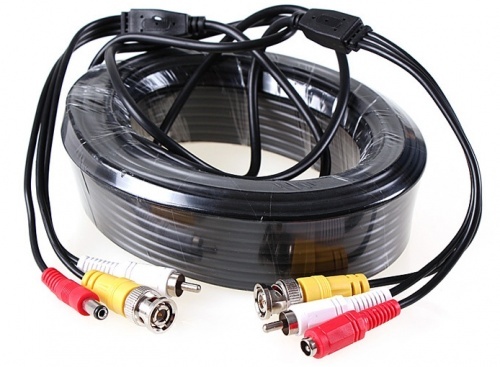 It has bnc connection at both ends to connect the camera directly to the dvr or tv, a male dc power connection at one end for the camera and a female dc power connection at the other end for the power adaptor to connect to and a phono connection at either end, one to connect to a microphone and the other to connect to a tv or dvr recorder. I used this cable to put a microphone on to my wireless calving camera, works great in cattle shed.